First the good news: Baking these biscotti made my house smell magical, like being inside a gingerbread house (without those nosy Hansel and Gretel or that mean old witch). 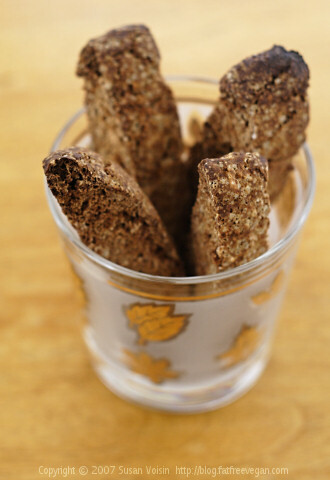 Furthermore, my daughter loved them, which surprised me because I’d always considered biscotti a grownup cookie, hard and crunchy and meant for dipping into grownup drinks like coffee, tea, or wine. Who knew they’d taste great dipped in hot chocolate soymilk? In a large bowl, combine the flour, sugar, all spices, and baking soda. In a smaller bowl, whisk together the egg replacer powder and water. Add it to the flour mixture, along with the molasses and vanilla. Mix well to combine. If the mixture is too dry and still crumbly, add a little more water a tablespoon at a time, just until the dough will hold together in a sticky ball. Turn the dough out onto a floured surface and divide in two. Shape each half into two logs about 2 inches wide. Place them on an oiled cookie sheet or silicone baking mat and flatten to about 1 inch high. Bake for 30 minutes. Remove from oven and allow to cool for 10 minutes. Cut into 1/2-inch slices on the diagonal. Place the slices cut-side down on the baking sheet and bake for 10 more minutes. Turn them over and bake for 8-10 more minutes. Remove from oven. 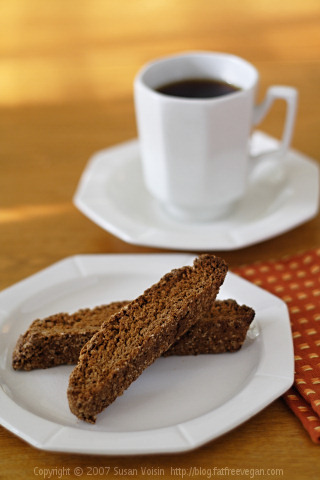 Biscotti may seem soft at first but they will harden as they cool. Note about flours: These turn out best with unbleached white flour. 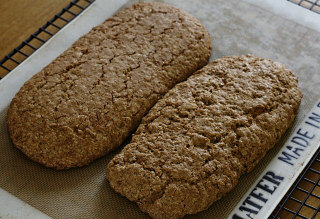 However, you can use a combination of white and white whole wheat, as I did in the ones pictured above. Use gluten-free flour at your own risk: mine, using Bob’s Red Mill gluten-free baking mix, turned out gritty and, when dunked, mushy. I advise using another gluten-free flour. Makes about 24 biscotti. Each one, using half whole wheat/half white flour, contains 54 Calories (kcal); trace Total Fat; (1% calories from fat); 1g Protein; 13g Carbohydrate; 0mg Cholesterol; 40mg Sodium; 1g Fiber. So that’s the official recipe. Here’s what actually happened. I don’t know if it’s because my flours were dryer than usual or if it’s because of the change from using all unbleached white flour, but the amount of liquid in the recipe was not enough to moisten all the flour. I started adding water by the tablespoon and had to add about 4 of them to get a dough to form. I’ve made these several times before and never had that problem, so I’m assuming it was the flour. Don’t be afraid to add more water if you have to, but don’t make the dough too wet either. The dough grew so much in the oven that the rolls were actually touching. This is not supposed to happen, so be sure you put your rolls far enough apart and don’t make them too wide. I put it on the baking sheet as best I could and decided to just pile all the crumbs in the middle and use them in place of graham cracker crumbs later. 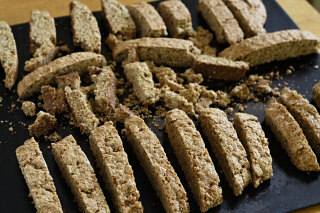 In this photo, the whole wheat biscotti are in the front, the g-f crumbs are in the middle, and the g-f biscotti are in the back. 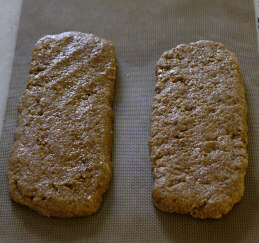 Only two of my g-f biscotti were completely intact. 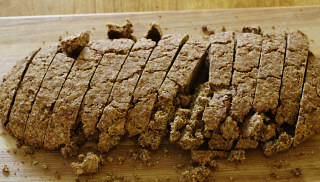 Besides falling apart more than the wheat biscotti, the gluten-free ones, pictured above, also burned a little on the ends. I had high hopes that they would at least taste good, but no such luck. Dry, they’re grittier than the wheat biscotti and dunked, they turn to mush–the kind of mush that seems to grow as you chew it so that it takes forever to get out of your mouth. Now, with some other kind of gluten-free flour, these might taste great. 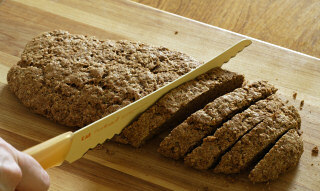 Also, using another egg replacer–one that will bring some stretchability to the dough–might help with the crumbiness. Maybe I should have included xanthan gum. I know that an experienced gluten-free cook like Karina or Ellen could work wonders on these. But for now I’ll have to be satisfied that at least my whole wheat ones came out wonderfully crunchy, sweet, and zingy with gingery-spice flavor. I don’t make a lot of cookies. Let’s face it, other than biscotti, most cookies depend on fat for their texture and flavor. Besides this recipe, the closest thing I make to a traditional Christmas cookie is Skinny Figgy Bars, created to imitate the fig bars my husband grew up eating every Christmas. But if you’re looking for dozens of tasty cookie ideas, be sure to check out Food Blogga’s Eat Christmas Cookies event. The entries look amazing–and some of them sound easily veganizable. I’m adding this one to the event so at least there’ll be one fat-free entry! fantastic recipe!!! perfect with a soy chai latte and i had them in the morning for breakfast. thank you for the great recipe! I don't usually bother with low-fat cookies, but these are really good. They are a bit dry plain, but I actually like the texture of these better than regular biscotti after they've been dunked. I added raisins to mine and used stevia for half of the sugar. Thanks for another great recipe! Hi! I rarely post criticisms, and for the most part I have absolutely loved all of the recipes of yours I have tried, but I really had some trouble with this one. I found them to be a little dry and even after dunked, I found their consistency to be a bit "off." Not sure what suggestions to offer, but it wasn't the dryness or hardness that bothered me, but the blandness. Would love to be able to try this again…just not sure what adjustments to make. Hi. Great recipes, all! And my issue with this one is probably ME…but I have to ask. I have tried and failed at both this one and the cinnamon version. Tried and failed 4 times, matter of fact. And in each case the failure was that terrible, sickening, salty baking soda taste/aftertaste. Only one out of 4 tries, could I even eat the final product. I’m meticulous with following measurements, btw. Now, here’s my basic question…where is the acid in the recipe? Is it the EnerG? I’m starting to wonder if there is none. Or maybe not enough? There is some because I get bubbling and the loaves rise beautifully just like your’s. But still that awful salty taste. Is it just me? Advice, please! I wish I did! My daughter has been wanting to make one, too. I could have sworn I’ve seen someone do it on a vegan blog, so try doing a Veg Blog Search: http://www.vegblogsearch.com. Hi, I was just wondering if flax would be ok instead of the ener-g egg replacer? I haven’t tried it, but I think it should work, if you grind it first. I found this gf biscotti recipe with a gf blen that might work for this recipe. I substitute pumpkin purée for the water, which adds taste and moisture.